WHENEVER rain clouds roll in on Monto's horizon, Simone King feels the excitement. 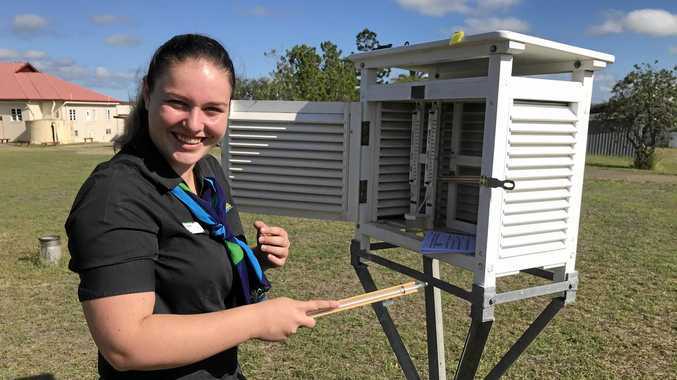 No, she's not a producer - Ms King works at the North Burnett Regional Council and her job is to take the weather measurements each morning. Monto has a manual weather station, the only one remaining in the North Burnett. Ms King has been taking the measurements for three months now and recalled her first time. "I was keen, but so nervous,” she said. Ms King said being in control of the local weather recording was a good conversation starter. "My partner asks me what the reading was today; so do my parents,” she said. Ms King said she hasn't been so interested in weather since Year 3 when she learned about different cloud formations. As close to 9am as possible, Ms King visits Monto's 'Stevenson Screen', a climate controlled box that contains the instruments. Inside are two bulbs: one is "100 per cent dry” and the other, wrapped in muslin cloth, is "100 per cent humidity”. Monto's humidity can be discerned from these two bulbs. Then, there are also two thermometers, one mercury-based for the maximum temperature and one alcohol-based for the minimum. A third thermometer, to measure the terrestrial temperature, is located outside. This outside thermometer is needed as sometimes the ground temperature can be lower than that recorded in the Stevenson Screen, sometimes so low as to form frost. The station also contains a rain gauge. All these measurements are sent to the Bureau of Meteorology.